Jamie Dimon: Cheer up, America! 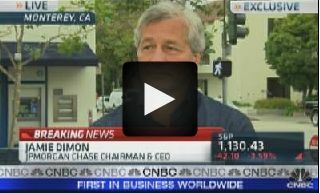 While the markets are going crazy, Jamie Dimon, chairman and CEO of JPMorgan Chase & Co., is out visiting bank customers and employees on a bus tour in California – and giving an interview today with CNBC. His core message: Cheer up, America! That’s not bad advice for investor relations folks, either. Confidence is like a secret sauce. … Here’s what I would say to the American public in total. When you go to sleep at night think about the following before you get depressed and you see the market down 500 points: This nation is still the greatest nation on the planet. It was the first democracy on the planet. We have the best military on the planet, and God bless our veterans all around the world, those who have served and those who are serving today. We have the best universities on the planet and the best businesses. Those things that I just said – best military, best rule of law, most innovation, the hardest working ethic of all – those things are going to be here for decades. They’re not going away. The strength in the system is going to blow your socks off when it gets out of this malaise we’re in. Those things are there. It’s good to see an executive smiling. Regardless of what you think of Dimon or big banks, he’s expressing the spirit that drives American business. It’s worth watching both pieces on CNBC. Just to feel better on another day of, as they say, volatility. By the way, in 2008 I shared 10 ideas on doing IR in a bear market. These apply today, too, for investor relations practitioners surveying the Wall Street carnage. I’d welcome your comments or ideas on helping our companies rise above the malaise. The cover of the latest Newsweek shouts “The Recession Is Over!” A balloon and an exclamation point add emphasis, although writer Daniel Gross layers on the qualifications – making it clear the economy, even if it is at a turning point, remains in turmoil. For my money, it’s a little premature to celebrate. I’m skeptical of newsweekly covers. And too much pain seems to be lingering – for consumers, workers, capital markets and companies. The sunshine hasn’t broken through enough to banish the dark clouds in favor of sunny days. Yet a glimmer does shine through, here and there. Recovery will come, maybe soon. And my sense is that investors are looking for signs, seeking each ray of light, asking if good news is coming next quarter, or the next after that. So investor relations people need to be asking: What’s our recovery strategy? How do we offer forward-looking perspective? What do we say in an uncertain time when we see hope but can’t be sure? And when do we declare recovery has arrived? … Explain the recovery strategy. Our job in IR, any time, is to help investors understand our companies’ strategies for creating value. Right now, shareholders are battered but very much looking forward and wondering what’s next. With more than a little nervousness, they want to know where we go from here. In a piece called “Beyond Challenging Markets,” the consulting firm Deloitte says shareholder returns vary much more among companies around a recession than in good economic times – that is, some emerge as winners that outperform for investors, while others survive but never quite lift off for shareholders. Deloitte outlines four stages of strategy for recession and recovery: strengthening the balance sheet, optimizing performance, building confidence and positioning for the future. Most companies have addressed the first two by working to reduce debt and cut costs; now we’re looking forward. Building confidence as a basis for outperforming in a recovery, Deloitte suggests, may include improving corporate governance; demonstrating a strong approach to anticipating and managing risk; creating realistic expectations and delivering on promises; and responding proactively to the prospect of increasing regulation. Deloitte says positioning for the future means developing a strategy for achieving near- and intermediate-term growth in existing businesses; changing the business model where markets or conditions have changed (e.g., ongoing credit limitations or sluggish consumer spending); and expanding through M&A or new products. The consultants’ emphasis is that CEOs and senior management should be doing the work of strategy formation for the next phase of the economy. But IROs, equally, should be taking on the job of explaining strategy for what’s coming next. … Give historical perspective. One of the best ways to talk about the future is to talk about the past. In today’s Wall Street Journal, Justin Lahart analyzes “the Great Recession” in comparison to eight decades of economic slumps (with cool interactive graphs online, if you’re an Econ nut). Most companies can draw upon experience with past recessions – and the recoveries that followed. So we can speak factually about how recovery tends to work its way through our business. … Share specialized knowledge. Companies can add value for investors and nurture lasting relationships by sharing industry-specific insights. That means helping investors, especially generalists, understand how the business cycle works its way through your sector, how the competitive landscape is changing, and what special risks or opportunities you see. Your view of the business in which you compete is a valuable perspective to add to the investors’ mosaic. … Don’t be overly optimistic. A realistic tone, infused with humility, seems to fit the times. Most of us didn’t predict the economic turmoil would be this severe, so we have reason to be cautious about forecasting the strength or timing of recovery. There are positive signs. Floyd Norris of The New York Times notes: “The index of leading indicators, which signals turning points in the economy, is rising at a rate that has accurately indicated the end of every recession since the index began to be compiled in 1959.” And various industry-specific indicators show upticks. We could truly be at the bottom, although some business people sound more like they just can’t imagine things getting any worse. The recovery may already be underway. Or, as Norris says, we may be entering the first upstroke in a W-shaped recovery, only to face a second downturn of unknown severity. To be clear, I’m not trying to call an economic recovery – or deny it. 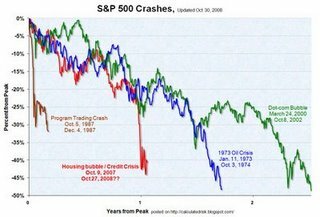 My point is that as IR people we need to be thinking and communicating about the coming recovery, probably without predicting the timing. When should we declare that recovery has arrived? Personally, I favor a factual approach that keeps investors current on company or industry-specific indicators, including third-party economic data. And then I would suggest waiting to break out the champagne until actual results start to show improving sales and profits. That’s when investors will start breathing easier. A dry summer ahead for funding? There may be no summer lovin’ for biotechs. By most accounts, investors will remain tight-fisted with their cash for some time, opening up their wallets for only the most promising investments. Writer Eric Wahlgren cites Burrill & Company estimates that more than a third of 344 public biotechs were down to less than six months cash on hand at the end of the first quarter. Despite the gloom, there’s still investment money out there, but companies will have to work harder to get it, experts say. The key to being successful at raising money in the current environment will be to think creatively, remain flexible, and start talking to potential investors well before there is an urgent need for cash. In the BIO piece, industry players suggest biotechs may have to tap existing venture capital investors for inside-led rounds, consider venture debt, outlicense more compounds for the cash, set up special financing structures and the like. The advice for companies looking for cash, [Exelixis CFO Frank] Karbe says, is that they should always be having lots of discussions with all types of investors, including bankers, venture capitalists, specialty funds, and other biotech and pharma companies. Thinking creatively and working harder, by the way, may mean experiencing more than the usual pain in fundraising and valuation – for example, selling the company when you’d rather just raise cash. The advice to biotechs – work hard, stay flexible, be creative – probably applies to investor relations teams in many industries. Money doesn’t seem likely to rain down on anyone in 2009. “Get out there” – despite the tough economy and market. The recession causes some CEOs to withdraw because they don’t feel comfortable with a negative macro picture and the difficulty of predicting where it’s headed, Cole says. Companies need to explain what they don’t know, as well as what they do, he says. And investors won’t expect a CEO or IRO to have crystal-ball answers that no one has. They’re looking for sound management and strategy amid this environment. A bunker mentality creates a dual “opportunity” for the IRO: First, you can be an advocate with the CEO and CFO to get out and meet with investors – build credibility and distinguish your company. And, second, as an IR person you can get out more yourself – if the CEO or CFO will send you, it’s a great time to develop your relationships with investors and analysts without taking their time. Stepping up at a difficult moment enhances your stature. Be a strong advocate for good disclosure, including taking your hits when things go wrong. Cole told of a heated internal debate, in a former job, when a key clinical trial failed for a biotech company: Do we announce the trial failed, or come up with positives to gloss it over? Telling it straight, Cole said, is how companies develop long-term credibility with investors and other constituencies. “If you’re correct in what you’re doing, you really should be willing to push your management team very hard to do the correct thing,” he said. Be sure you’re targeting IR efforts to the appropriate investors. In the life cycle of companies, and through economic cycles, your mix of investors will change. You may know and love the manager of a giant mutual fund, but if you’re a microcap you won’t be appropriate for that manager’s portfolio – so meetings and communication could be wasted. Cole says a database of institutions yielded 2,500 investors who have owned names in his company’s industry in the past 12 months. He and the CFO know the top 75 or so very well. But those aren’t necessarily the ones they should target right now – smaller funds by make a better fit – he says. The IRO brings expertise to decisions on where to focus efforts for maximum benefit. From a career standpoint, a tough market can be a time to shine. Most IROs are probably getting more face time with CEOs, CFOs and boards right now – in a crummy market – than during easier times, Cole notes. It’s a time to be the center of information for those constituencies. Create an “Ask and Read Hour,” Cole suggests. Set aside time to increase your expertise in critical areas. He suggests reading more about your industry, your market, how-to ideas for IR, your boss’s concerns (read magazines that the CFO or CEO draw upon). Also, ask questions that help you learn: What do your analysts or investors want that they don’t currently get? Where do industry experts see down the road? What is the CEO’s strategy? Investor relations is about explaining your company – and this doesn’t change in a tough economy or bear market. Cole says the macro environment may change your content, but not the mission of IR. You need to keep explaining your business, what your company does, how you see the economic situation and its impact on your business. Really, says Cole, it’s not about “Winning IR in a Tough Economy.” It’s just about “Winning IR.” And he’s right. A couple of Boston Consulting Group gurus urge companies to “Seize the Advantage in a Downturn” in the February 2009 issue of Harvard Business Review – and investor relations is part of their story. Your company’s share price, like that of most firms, will take a beating during a downturn. [Been there, done that – my comment.] While you may not be able to prevent it from dropping in absolute terms, you want it to remain strong compared with others in your industry. In a downturn, our data shows that markets typically reward a strong balance sheet with low debt levels and secured access to capital. Instead of being punished by activist investors and becoming a takeover target for hedge funds, a company sitting on a pile of cash is viewed positively by investors as a stable investment with lower perceived risk. For that to happen, you need to create a compelling investor communications strategy that highlights such drivers of relative valuation. This will also be important as you try to capitalize on the competitive opportunities that a recession offers, such as seeking attractive mergers and acquisitions. The consultants also say raising dividends has proven more effective than share buybacks in driving valuation. But they note the potential conflict between richer dividends and maintaining a healthy cash hoard.